With the growth that this ministry has seen over the years and with the new opportunities we have to make a difference in the lives of students on campus, we have a need for more leadership among our students. This is an exciting time for this ministry, and we invite you to read further and pray about your involvement in our leadership team. We are introducing 7 positions that will be appointed by our current and newly elected leadership team after they have reviewed all applications. Below, you will find descriptions of the responsibilities of each position, followed by an application. We ask that you take your time with this application and know that we are praying for you throughout this process! If you would like to apply for multiple positions, please feel free to do so. Please be aware that you may be called for further questions if the student leaders see fit. We will be accepting applications until 9:30am on Friday, April 26th. A few basic requirements for our leadership team include: you must be enrolled in the University of South Florida for both Fall and Spring Semester of the following school year, you must be registered with our organization on BullSync, and you must have been a student at the University of South Florida for 2 semesters prior to your appointment. Thank you so much for your love for this ministry! The Historian will be in charge of all social media for the Catholic Student Union including Instagram and Facebook. They will create graphics for our social media, website, emails, and promotional items and will also take pictures at student events. The Outreach Coordinator will make sure that the Catholic Student Union has a table for Bull Market every Wednesday and will find students to table at this event. They will make sure that our A-frame signs on campus and permits are up to date and moved when needed. The Outreach Coordinator will make ads for CSU to go in the Oracle and the USF Note-A-Bull e-newsletter. They will also be tasked with coordination for special events, such as Relay for Life, IM Teams, Sporting Events, Tailgates, Catholic Cantina, Camping Trips, and Beach Trips. The Men&apos;s Group Leader will plan, organize, and execute weekly events for the men. This person will be a good leader for our men&apos;s community. The Women&apos;s Group Leader will plan, organize, and execute weekly events for the women. This person will be a good leader for our women&apos;s community. The Development Coordinator will attend Development Team meetings as a representative for the student community. They will organize fundraising efforts for the CSU and help with Student/Alumni cooperation. They will also organize student participation in the development of the ministry. The Student Liturgical Coordinator will be tasked with recruiting, training, and organizing student Lectors, Eucharistic Ministers, Altar Servers, Ushers, and Sacristans. They will also prepare for First Friday Devotion and help with decorating the Sanctuary for new Liturgical Seasons and Holy Days. The Master of Ceremonies for Liturgy will be tasked with executing Liturgy for special masses, such as the Baccalaureate Mass, Red Mass, Ash Wednesday Mass on campus, and All Saints Day Mass on campus. 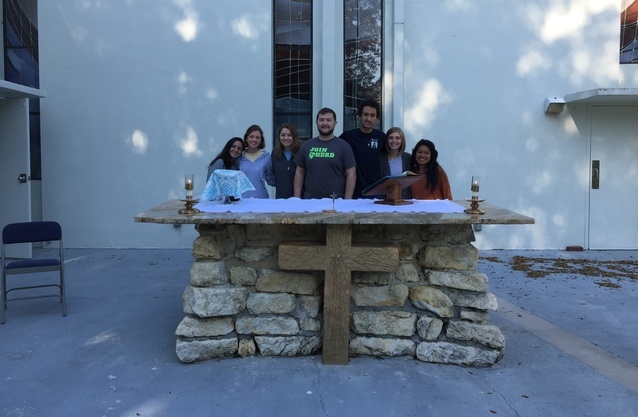 They will also be the Sacristan for the weekly 12:30pm Sunday Masses on campus during the semester. Year in School REQUIRED (Select One) Sophomore Junior Senior Graduate Student Please fill out this field. Position You&apos;re Applying For REQUIRED (Select One) Historian Outreach Coordinator Men&apos;s Group Leader Women&apos;s Group Leader Development Coordinator Student Liturgical Coordinator Master of Ceremonies Please fill out this field. Would you be willing to accept another position? REQUIRED (Select One) Yes No Please fill out this field.